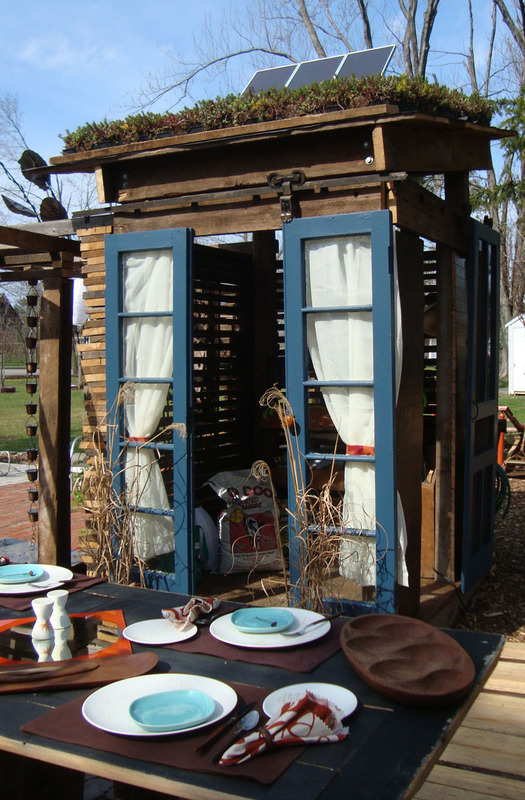 This temporary garden was built for a 3 week exhibit as part of the 2009 Junior League Decorator Show House. 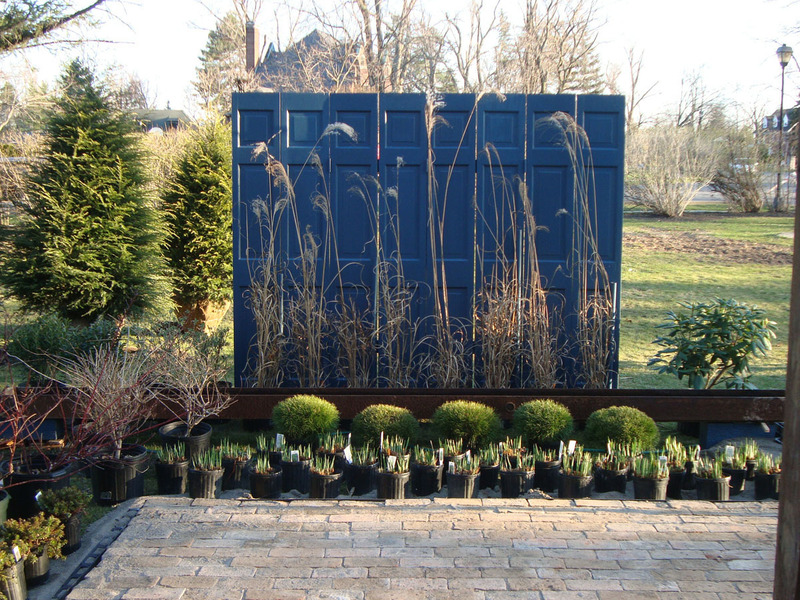 On a cold January day, the editor for Buffalo Spree magazine brought us an idea that had for creating the first ever real garden for the upcoming Jr League’s Decorator Show House. The organization had been using Show Houses over the years as successful fundraising events showcasing the beautiful architecture of Buffalo’s historic homes. The coming year’s project would be located on a sizable lot, and brought with it the first time a distinct garden could be incorporated into the Show House program. 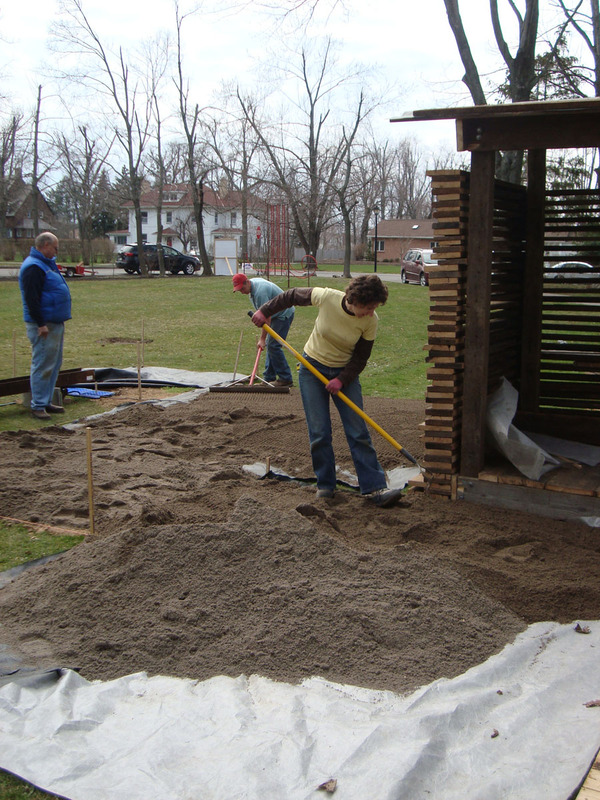 Spree’s editor had a specific interest in creating a “Sustainable” garden that could be used to propel the local dialog around what sustainability meant and how sustainability, through various expressions of it, might be achieved in Western New York Gardens. That afternoon brought the brainstorm idea to partner Buffalo Spree Magazine and JKLA along with Urban Roots, a downtown garden center, and Buffalo ReUse, a local store that specialized in architectural salvage to create a 9,000 sf demonstration garden exhibit with the intention of showcasing landscape architecture and sustainable design. 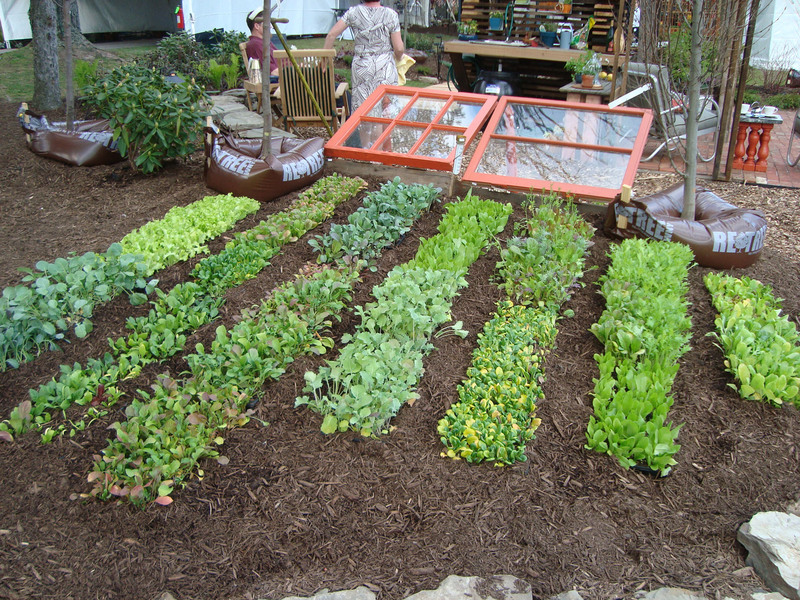 The idea was to create a beautiful backyard garden, incorporate as many sustainable methodologies and products as possible, using reclaimed materials as possible, create a space where environmental information could be shared, and because it was only a temporary exhibit garden, we needed to do it all with a budget of less than $200.00 in cash. The result was an award winning exhibit and a Show House visitor favorite. The next three months brought the unique challenge of bringing a demonstration garden to life in a second story warehouse space before it could be brought to the site in late April. When designing this garden, a space that rivaled the square footage of the Show House’s living room, JKLA focused on two aspects of outdoor living in Western NY: a restful and beautiful outdoor living area, and the function of actually tending a vegetable garden. Through our partner Buffalo ReUse, we had the raw materials to create the amazing structures that formed the architecture of the garden, like the garden shed which formed the “center hub” of the garden and was created from stacked floor boards, a screen door with sliding barn door hardware, two glass entry doors and wainscoting forming the potting table at the rear and a serving counter for the living room along the side. The roof of the shed boasted green roof trays with the three solar panels powering one of two water features in the garden. 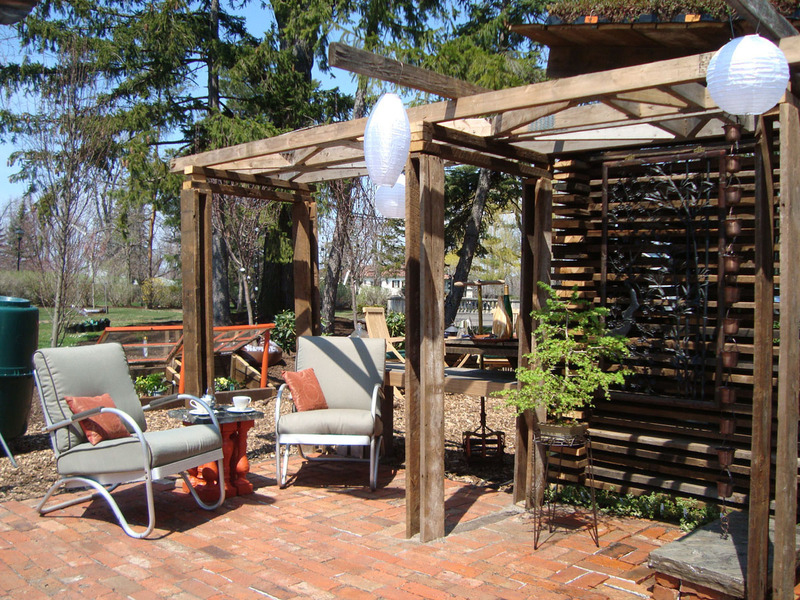 The pergola between the dining room and the living room areas of the garden used wood frame trusses turned on their side to create beautiful shadow patterns on the pavement throughout the day. 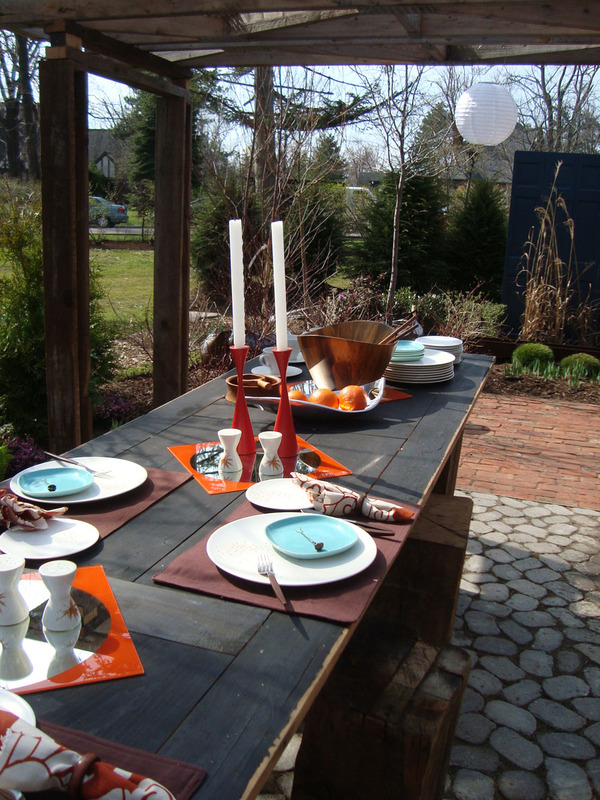 The brick pavers, the outdoor dining table, seating, the folding screen wall, and even the fireplace surround, which used cans of clean burning gel rather than wood, were created completely from reclaimed materials found at ReUse. 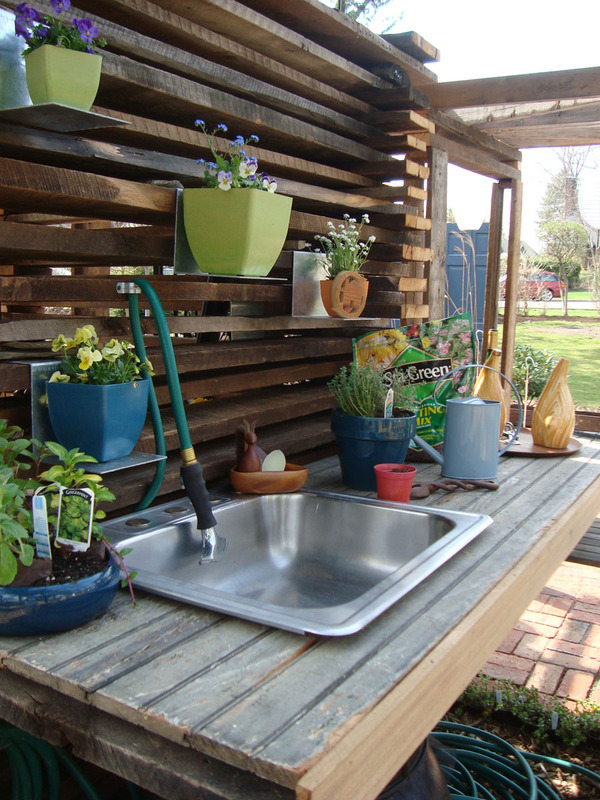 For the vegetable garden, JKLA featured a stainless steel garden clean-up sink for washing freshly harvested veggies where the waste water drained to a rain barrel, allowing the water to be used again for irrigation. 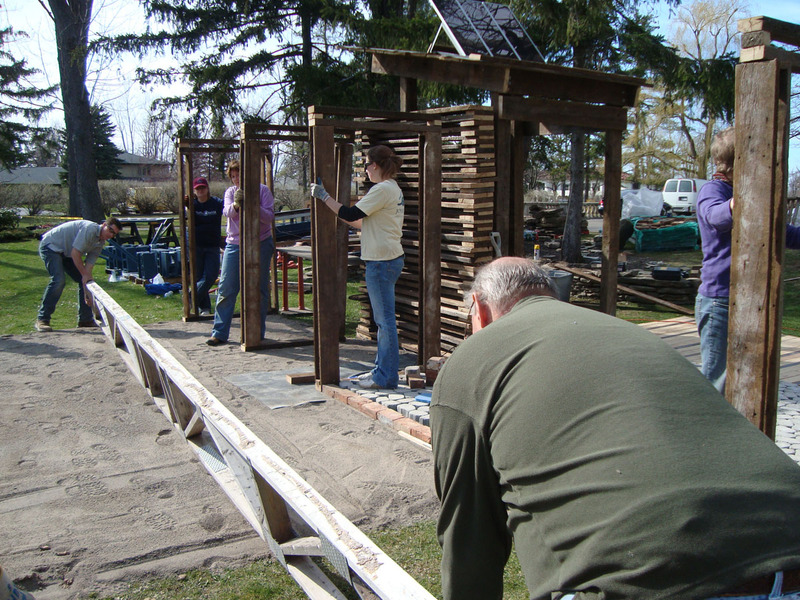 The shed’s potting benches and cold frames for seedling starting were created from reclaimed materials, while rain gauges and a tumbling composter were borrowed from Urban Roots. 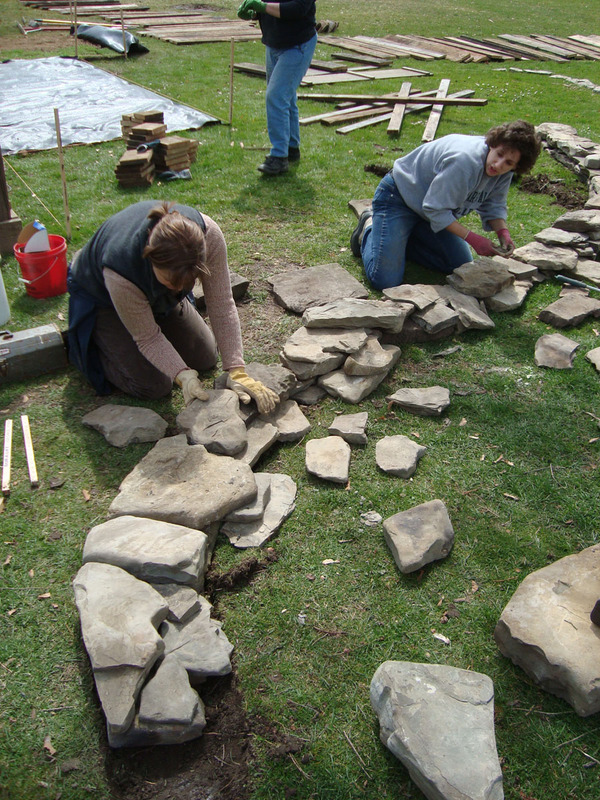 A dry stacked stone wall was created from reclaimed barn foundation, and our organic lettuces were grown up from seed in a local hot-house the month before, ensuring our garden would be ready for an April harvest, an unusual sight in Buffalo. 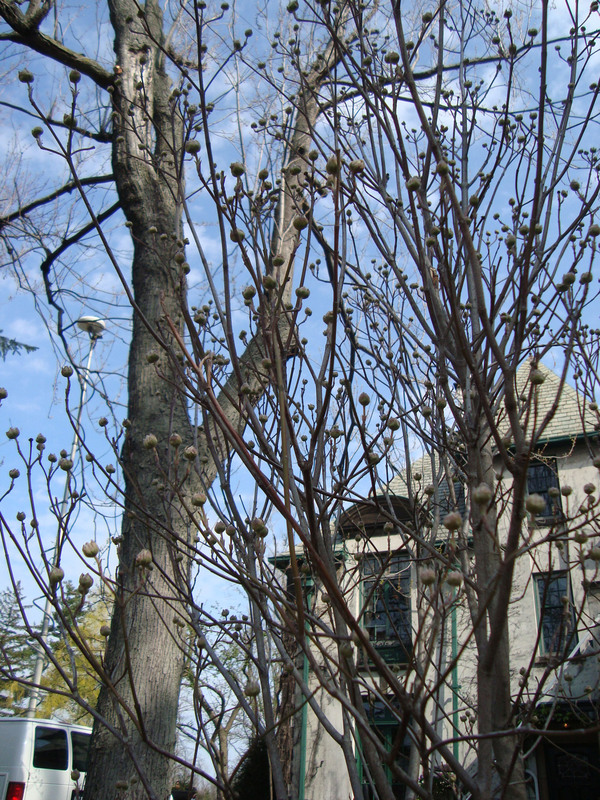 Because the garden would be viewed in April and May, we borrowed trees and plants to highlight the beauty of branching structure, flower buds rather than actual flowers, as well as evergreen materials and ornamental grasses still holding on to the previous year’s foliage. One of the most dramatic elements of the garden included a water feature that seemingly splashed endless amounts of water through the patio pavers. 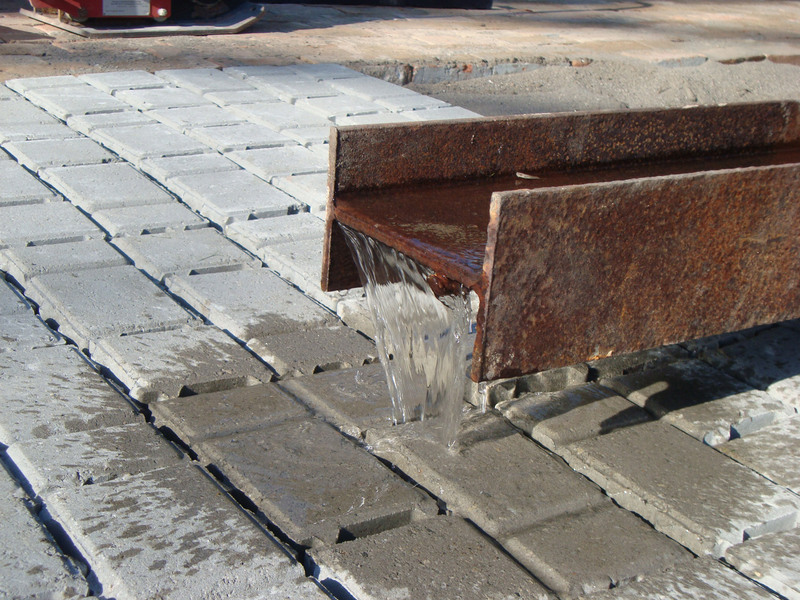 A steel “I”beam, permeable pavers and a recirculating pump created this fascinating illusion and spurred many conversations on the conservation of water. Event docents were given specific tour information highlighting the sustainable aspects of the garden, and JKLA participated in the weekly “Meet the Designer” nights for special behind the scenes tours. JKLA thanks the following partners for their invaluable contributions to a wonderful project: Buffalo Spree magazine; Buffalo ReUse; Urban Roots Garden Center; Nate Berner of Berner’s Landscaping; Alison Endl ; Coo Coo U Antiques; The English Gardener; Russell’s Tree and Shrub Farm; Cooper Ridge Nurseries; Horticulture Associates; Kees Grover and Live Roof; Unilock; Thruway Builder Supply; Rock Valley Natural Stone and the Cities of Amherst and North Tonawanda.